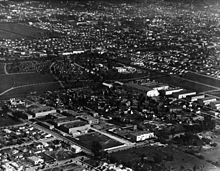 By 1912, major motion-picture companies had set up production near or in Los Angeles. In the early 1900s, most motion picture patents were held by Thomas Edison's Motion Picture Patents Company in New Jersey, and filmmakers were often sued to stop their productions. To escape this, filmmakers began moving out west to Los Angeles, where attempts to enforce Edison's patents were easier to evade. Also, the weather was ideal and there was quick access to various settings. 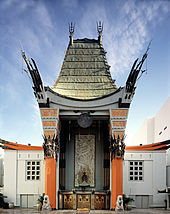 Los Angeles became the capital of the film industry in the United States. 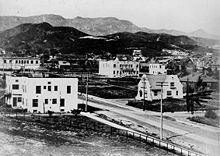 The mountains, plains and low land prices made Hollywood a good place to establish film studios. Hollywood became known as Tinseltown and the "dream factory" because of the glittering image of the movie industry. 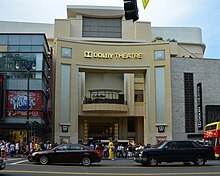 Hollywood has since become a major center for film study in the United States. The Will and Ariel Durant Branch, John C. Fremont Branch, and the Frances Howard Goldwyn – Hollywood Regional Branch of the Los Angeles Public Library are in Hollywood. ^ "Hollywood". Geographic Names Information System. United States Geological Survey. Retrieved January 7, 2018. ^ "Los Angeles Herald, Volume XXXI, Number 45". By the California Digital Newspaper Collection (November 15, 1903). Retrieved February 22, 2014. ^ "Hollywood Was Once an Alcohol-Free Community". By Rachel Nuwer of smithsonianmag.com. Retrieved February 22, 2014. ^ Annual Report of the Controller of the City of Los Angeles, California. ByOffice of Controller Los Angeles, CA (1914). Retrieved February 22, 2014. ^ Report of the Auditor of the City of Los Angeles California of the Financial Affairs of the Corporation in Its Capacity as a City for the Fiscal Year. 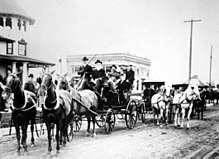 By Auditor's Office of Los Angeles, CA (1913). Retrieved February 22, 2014. ^ "Holy Moly How Did Hollywood Get Its name". ^ "Margaret Virginia Whitley Diary (1886)". ^ Margaret Leslie Davis,  (1993), p. 92. ^ Cahuenga Valley Sentinel (May 7, 1904). 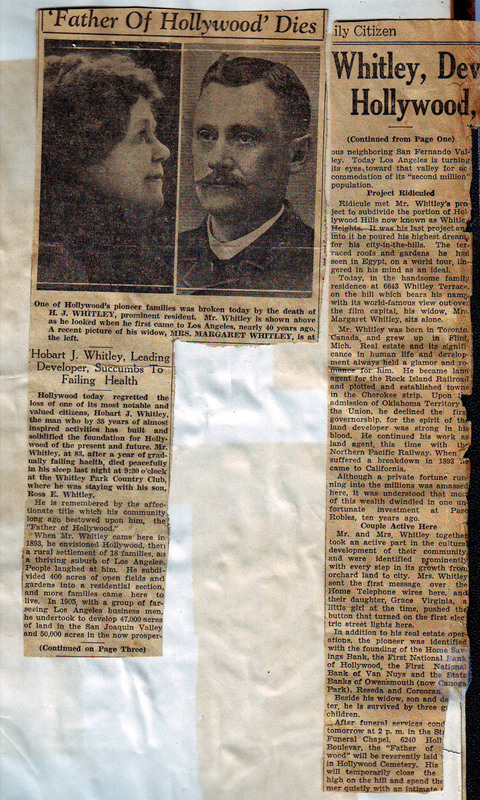 ^ Hollywood Citizen (Spring Addition March 4, 1914). 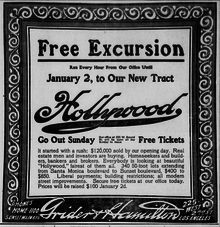 ^ Hollywood California | Hollywood History and Information Archived 2011-02-15 at the Wayback Machine. Abouthollywood.com (November 16, 2010). Retrieved on December 11, 2011. ^ "History of Hollywood, California". Retrieved May 27, 2014. ^ a b Mintz, S., and S. McNeil. "Hollywood as History." Digital History. N.p., 2013. Web. May 20, 2014. ^ Philip French (February 28, 2010). "How 100 years of Hollywood have charted the history of America". The Guardian. UK. Retrieved May 24, 2010. ^ RASMUSSEN, CECILIA (August 1, 1999). "L.A. Then and Now: Film Pioneer Griffith Rode History to Fame". Los Angeles Times. p. 3. ^ Dyson, Jonathan (March 4, 2000). "How the West was won Time lapse". The Independent. London (UK). p. 54. ^ Friedrich, Otto (1986). City of Nets: A Portrait of Hollywood in the 1940s. Berkeley and Los Angeles: University of California Press. p. 6. ISBN 0-520-20949-4. ^ "Without This Man, Hollywood May Not Exist". YouTube. January 22, 2011. Retrieved January 14, 2014. 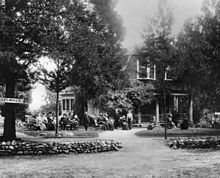 ^ "First Hollywood movie filmed on Whitley Estate on October 26, 1911". Cinema Treasures. July 7, 2010. ^ Robertson (2001), p. 21. It later became the Hollywood Film Laboratory, now called the Hollywood Digital Laboratory. ^ "Tinseltown". Collins English Dictionary. Retrieved January 14, 2014. ^ Slide, Anthony (February 25, 2014). The New Historical Dictionary of the American Film Industry. Routledge. p. 94. ISBN 9781135925543. ^ History of WOF Archived 2010-06-12 at the Wayback Machine hollywoodchamber.net; Hollywood Chamber of Commerce. Retrieved May 31, 2010. ^ "Kramer First Name Put in Walk of Fame"(abstract). Los Angeles Times, March 29, 1960, p. 15. Full article: LA Times Archives Retrieved June 12, 2010. ^ Vincent, Roger (November 19, 2014). "Viacom signs 12-year lease at Columbia Square in Hollywood". Los Angeles Times. ^ Kotkin, Joel (Summer 2012). "Let L.A. be L.A." 22 (3). New York City: City Journal. ^ Lin II,, Rong-Gong; Zahniser, David; Xia, Rosanna (April 30, 2015). 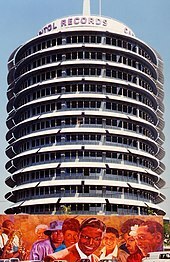 "Judge halts Millennium Hollywood skyscraper project". Los Angeles Times. ^ Vincent, Roger (January 30, 2014). "Vine Street resurgence continues with $285-million mixed-use project". Los Angeles Times. ^ Grand, Noah (November 5, 2002). "Valley, Hollywood secession measures fail". Daily Bruin. Retrieved December 29, 2013. 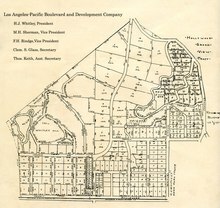 ^ a b ""Central L.A.," Mapping L.A., ''Los Angeles Times''". Projects.latimes.com. Retrieved January 14, 2014. 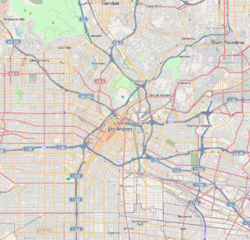 ^ a b c d e f g h i j ""Hollywood," Mapping L.A., ''Los Angeles Times''". Projects.latimes.com. Retrieved January 14, 2014. ^ "About". Whitley Heights. Archived from the original on August 18, 2013. Retrieved January 14, 2014. ^ "Whitley Heights | Office of Historic Resources, City of Los Angeles". Preservation.lacity.org. Retrieved January 14, 2014. ^ "Monthly Averages for Los Angeles (90028)". www.weather.com. Retrieved October 31, 2017. ^ "Johnny Grant, honorary Hollywood mayor, dies". CNN. January 10, 2008. Retrieved January 12, 2008. ^ "Hollywood-Wilshire Health Center." Los Angeles County Department of Health Services. Retrieved March 18, 2010. ^ "Post Office Location – HOLLYWOOD Archived 2010-03-30 at the Wayback Machine." United States Postal Service. Retrieved March 18, 2010. ^ "Post Office Location – HOLLYWOOD PAVILION Archived 2010-02-27 at the Wayback Machine." United States Postal Service. Retrieved March 18, 2010. ^ "Post Office Location – SUNSET Archived 2010-03-11 at the Wayback Machine." United States Postal Service. Retrieved March 18, 2010. ^ "Hollywood United Neighborhood Council". Hollywoodunitednc.org. Retrieved January 14, 2014. ^ "WELCOME | Hollywood Hills West". Hhwnc.org. December 10, 2013. Retrieved January 14, 2014. ^ "Hollywood Hills West Neighborhood Council Bylaws - Area Boundaries". Hhwnc.org. February 15, 2012. Archived from the original on January 21, 2014. Retrieved January 14, 2014. ^ Hollywood Studio District Neighborhood Council (January 1, 2014). 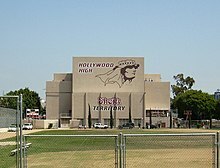 "Hollywood Studio District Neighborhood Council". Hsdnc.org. Retrieved January 14, 2014. ^ "Los Angeles Department of Neighborhood Enpowerment". Done.lacity.org. January 20, 2012. Archived from the original on November 14, 2013. Retrieved January 14, 2014. ^ "HSDNC.org: FAQs". Archived from the original on 2008-12-08. 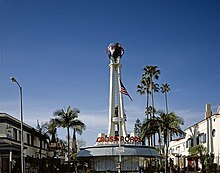 Wikivoyage has a travel guide for Hollywood. This page was last edited on 6 April 2019, at 02:24 (UTC).